Booklet folds compactly and can be stowed almost anywhere. With the booklet, folding a stroller has never been easier. 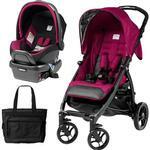 Its lightweight frame and unique "book-like" folding mechanism allows parents to quickly and easily close the stroller. The booklet folds inward ensuring that the upholstery is always protected and clean. Once closed it is compact and can stand on its own. 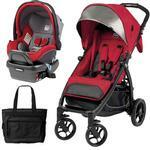 An automatic locking system is built into the chassis, which keeps the stroller closed. The narrow design of the booklet ensures that a very small footprint of space is taken up once it is stored. The streamlined design of the booklet allows it to be maneuvered with ease through heavy sidewalk traffic, narrow aisles and crowded elevators. The hood has an extendable upf 50+ protecting visor, which helps shield little ones from the suns UV rays. Wheels with ball bearings and suspension let the stroller be pushed effortlessly, while easily overcoming bumps and uneven surfaces. The frame is composed of lacquered aluminum, which is very solid and sturdy, yet lightweight enough to be easily maneuvered and carried. The booklet is travel system compatible with the primo viaggio 4/35 infant car seat. There is no need to worry about purchasing adapters with the booklet. Simply recline the stroller backrest and place the car seat on the built-in, retractable anchors and the travel system is ready to go. With the Booklet, folding a stroller has never been easier. 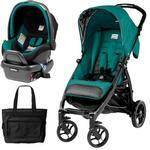 It’s lightweight frame and unique book-like folding mechanism allow parents to quickly and easily close the stroller. The Booklet folds inward, ensuring that the upholstery is always protected and clean. Once closed, it is compact and can stand on it’s own. An automatic locking system is built into the chassis, which keeps the stroller closed. The narrow design of the Booklet ensures that a very small footprint of space is taken up once it is stored. The streamlined design of the Booklet allows it to be maneuvered with ease through heavy sidewalk traffic, narrow aisles and crowded elevators. The hood has an extendable UPF 50+ protecting visor, which helps shield little ones from the sun’s UV rays. Wheels with ball bearings and suspension let the stroller be pushed effortlessly, while easily overcoming bumps and uneven surfaces. The frame is composed of lacquered aluminum, which is very solid and sturdy, yet lightweight enough to be easily maneuvered and carried. There is no need to worry about purchasing adapters with the Booklet. 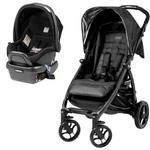 The stroller is travel system compatible with the Primo Viaggio 4-35 infant car seat. Simply recline the stroller backrest and place the car seat on the built-in, retractable anchors and the travel system is ready to go. Innovative design allows for quick and easy fold that closes inward, always keeping upholstery clean. The Booklet has an automatic locking mechanism and will standalone when folded. The backrest can be adjusted into a number of positions and it reclines fully, allowing it to welcome an infant. The hood includes a mesh window, is extendible and includes a sun shield with UV Protection of UPF 50+. Mesh is secured at the top of the backrest, ensuring perfect ventilation on the warmest days. 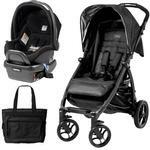 Travel System-compatible with the Primo Viaggio 4-35 car seat. The car seat can be attached directly to the stroller’s retractable anchors, without adapters.